Axis produced a masterplan for the rebuilding of the Egghill Estate in south Birmingham, an estate of 560 dwellings built in the 50s and 60s. Working from an office in an empty ground floor flat, Axis carried out consultation with residents which leading to an agreed masterplan for new dwellings, road layout, open space, and proposed commercial uses. The role of the masterplan is to provide a locally supported and reliable framework within which each part of the new development will fit ensuring the creation of a unified whole. The plan includes proposals for a new neighbourhood park and a commercial/business Park based on ecological design principles to ensure a sensitive fit within the existing topography and surrounding housing. 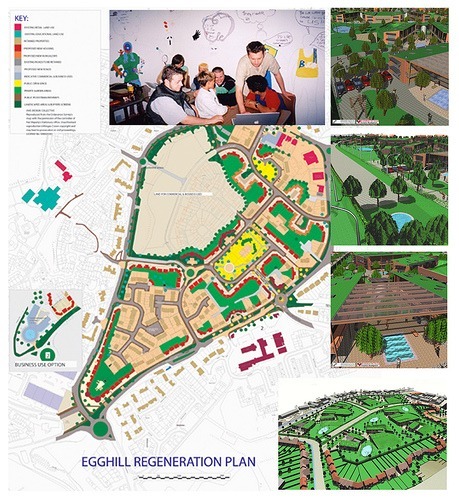 Locally based youth workers and community artists were involved with Egghill’s young people in a project about change and the future shaping of their environment, including the new Park.